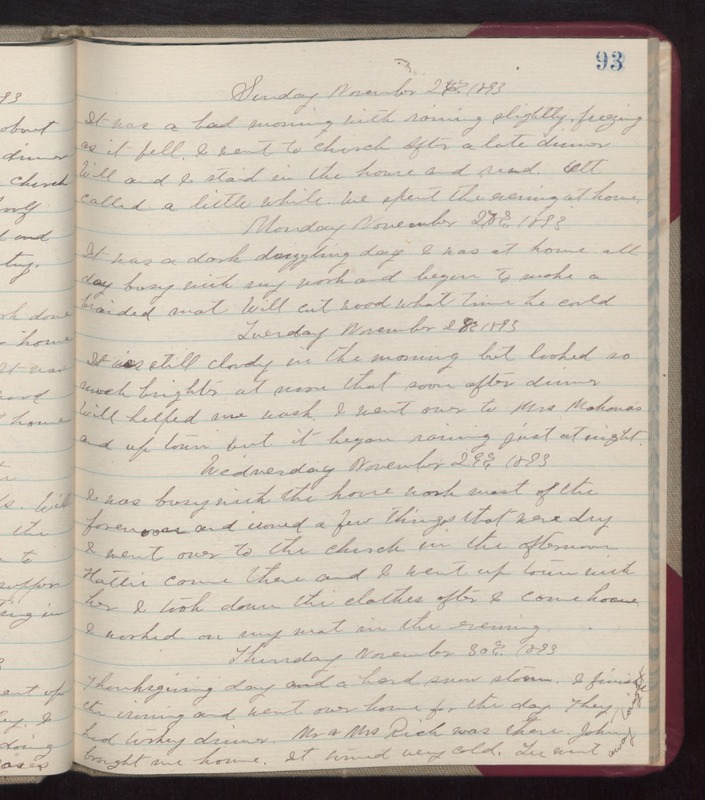 Sunday November 28th 1893 It was a bad morning with raining slightly, freezing as it fell. I went to church. After a late dinner Will and I staid in the house and read. Ott called a little while. We spent the evening at home. Monday November 27th 1893 It was a dark drizzling day. I was at home all day long with my work and began to make a braided mat. Will cut wood what time he could. Tuesday November 28th 1893 It was still cloudy in the morning but looked so much brighter at noon that soon after dinner. Will helped me wash. I went over to Mrs Mahanas and up town but it began raining just at night. Wednesday November 29th 1893 I was busy with the house work most of the forenoon and ironed a few things that were dry. I went over to the church in the afternoon. Hattie came there and I went up town with her. I took down the clothes after I came home. I worked on my mat in the evening. Thursday November 30th 1893 Thanksgiving Day and a hard snow storm, I finished the ironing and went over home for the day. They had turkey dinner. Mr & Mrs Rich was there. John brought me home. It turned very cold. Lee went away tonight.